Discussion in 'Motorcycle Buy & Sell - S.E. Asia' started by bung, May 26, 2011. Excellent condition, just 138 hours / 5491 klm's never raced or on the limiter, i am too old to take it to it's full potential! Maintained to the highest order strictly on time. Top synthetic oil used, all bolts torqued correctly and fluids changed regularly. Flatlands radiator guards and bash plate. Also, I have a complete and genuine top end rebuild kit, piston, valves, cam chain, gaskets etc ready to go when needed. 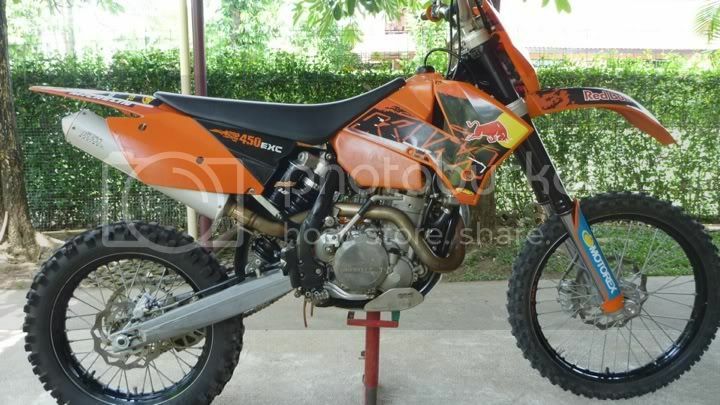 This I bought from KTM Australia at a value of B 35 000. I will also include some oil and air filters, lubes etc. Plus it comes with the rear tail light/mudguard, indicators, mirrors and horn as supplied new. Genuine and regretfull sale, this bike is a fantastic enduro weapon and this model won the 2007 WEC championship. Probably the best fun I have ever had on a bike! Bike is in Ciang Mai. It has no papers / book.